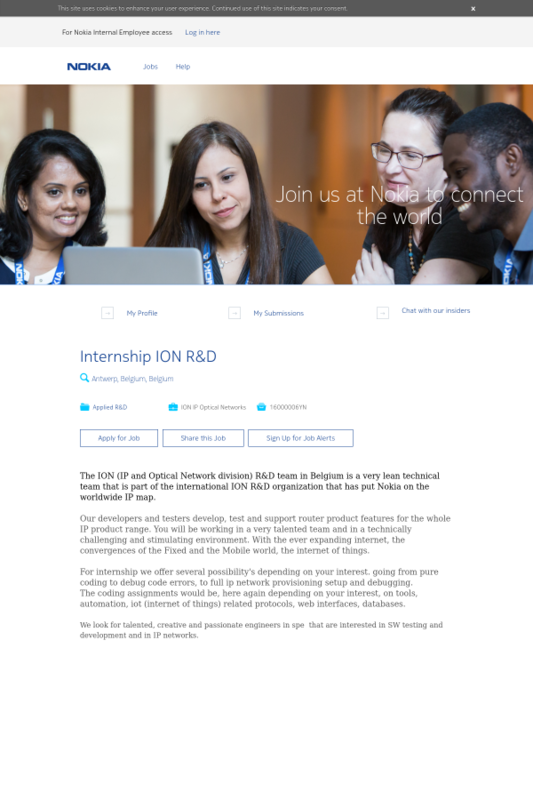 The ION (IP and Optical Network division) R&D team in Belgium is a very lean technical team that is part of the international ION R&D organization that has put Nokia on the worldwide IP map. Our developers and testers develop, test and support router product features for the whole IP product range. You will be working in a very talented team and in a technically challenging and stimulating environment. With the ever expanding internet, the convergences of the Fixed and the Mobile world, the internet of things. For internship we offer several possibility's depending on your interest. going from pure coding to debug code errors, to full ip network provisioning setup and debugging. The coding assignments would be, here again depending on your interest, on tools, automation, iot (internet of things) related protocols, web interfaces, databases. We look for talented, creative and passionate engineers in spe that are interested in SW testing and development and in IP networks.